One of the first lessons I learned with FileMaker is that of context! Layouts, reports, calculations, scripts, and so on all act from the perspective of a single Table Occurrence (TO) — the “context” — pulling in data from related tables as needed. Generally, the record set being acted on is the set of records in that context table occurrence or a found subset thereof. There are a few exceptions to this, however, and today we’re going to explore one of those. Let’s say I work in airplane maintenance, and we have a fleet of 3 aircraft that are required to have maintenance every month. My boss asks me to send her an output in Excel of all the planes, one row per plane, and the most recent date of maintenance for each. Then, the export would show the most recent maintenance date for each plane. I could also have created a dedicated TO just for this purpose. When I opened the Excel file, it wasn’t what I had expected to see. The first plane had been serviced 3 times. The second plane was a new plane, so it had not been serviced yet. The third plane had been serviced 6 times. Instead of the 3 records I expected based on the script’s context, the export contained 9 records! FileMaker expanded the export out to include all the related records, as shown in the image below. So how can I deliver the export listing each plane only once, with the latest maintenance date for each? 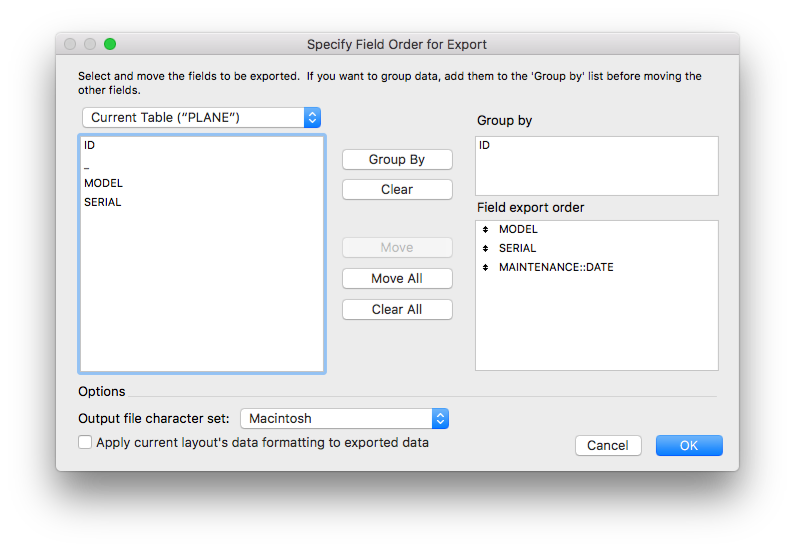 …which then allows me to use Group By in my export. This ends up delivering the expected result of outputting a list of planes with their most recent Maintenance Date. If all I had needed was to show this data on the PLANE layout then I would have been done once I had sorted the relationship and then displayed the Maintenance Date field on the layout (no portal needed). Sometimes we have a lot of confidence in what we think are simple things, but FileMaker can surprise us now and then, which is why we always test everything we write. Excellent tip for this situation! How would you handle if your boss wanted the entire maintenance history instead? 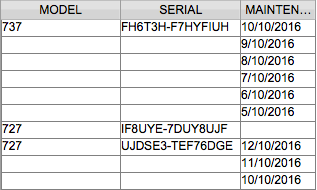 For example, she wants the data you show in the table above but with the model & serial number on each line instead of just the first occurrence.